In their recent KEXP performance The Transmissionary Six do a cover of Galaxie 500's Tugboat. The set was recorded in March but has just appeared on the KEXP Live Performances podcast. 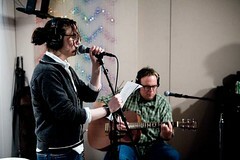 You can download the whole set from KEXP (41MB mp3).